Not to be confused with Clopidol. Clopidogrel, sold under the trade name Plavix among others, is an antiplatelet medication used to reduce the risk of heart disease and stroke in those at high risk. It is also used together with aspirin in heart attacks and following the placement of a coronary artery stent (dual antiplatelet therapy). It is taken by mouth. Onset of effects is about 2 hours and lasts for 5 days. Common side effects include headache, nausea, easy bruising, itching, and heartburn. More severe side effects include bleeding and thrombotic thrombocytopenic purpura. While there is no evidence of harm from use during pregnancy, such use has not been well studied. Clopidogrel is in the thienopyridine-class of antiplatelets. It works by irreversibly inhibiting a receptor called P2Y12 on platelets. Clopidogrel was patented in 1982 and approved for medical use in 1998. It is on the World Health Organization's List of Essential Medicines, the most effective and safe medicines needed in a health system. The wholesale cost in the developing world is about US$0.77–31.59 per month. In the United States, a month of treatment costs less than US$25. In 2016, it was the 34th most prescribed medication in the United States, with more than 21 million prescriptions. Clopidogrel is used to prevent heart attack and stroke in people who are at high risk of these events, including those with a history of myocardial infarction and other forms of acute coronary syndrome, stroke, and those with peripheral artery disease. In those with stable ischemic heart disease, treatment with clopidogrel is described as a "reasonable" option for monotherapy in those who cannot tolerate aspirin, as is treatment with clopidogrel in combination with aspirin in certain high risk patients. It is also used, along with acetylsalicylic acid (ASA, aspirin), for the prevention of thrombosis after placement of a coronary stent or as an alternative antiplatelet drug for people intolerant to aspirin. Clopidogrel's benefit is primarily in those who smoke cigarettes (25% benefit), with only slight (8%) benefit in those who do not smoke cigarettes. Consensus-based therapeutic guidelines also recommend the use of clopidogrel rather than ASA for antiplatelet therapy in people with a history of gastric ulceration, as inhibition of the synthesis of prostaglandins by ASA can exacerbate this condition. In people with healed ASA-induced ulcers, however, those receiving ASA plus the proton pump inhibitor esomeprazole had a lower incidence of recurrent ulcer bleeding than those receiving clopidogrel. However, prophylaxis with proton pump inhibitors along with clopidogrel following acute coronary syndrome may increase adverse cardiac outcomes, possibly due to inhibition of CYP2C19, which is required for the conversion of clopidogrel to its active form. The European Medicines Agency has issued a public statement on a possible interaction between clopidogrel and proton pump inhibitors. However, several cardiologists have voiced concern that the studies on which these warnings are based have many limitations and that it is not certain whether an interaction between clopidogrel and proton pump inhibitors is real. Hemorrhage – the annual incidence of hemorrhage may be increased by the coadministration of aspirin. The CAPRIE trial compared clopidogrel monotherapy to aspirin monotherapy for 1.6 years in people who had recently experienced a stroke or heart attack. In this trial the following rates of bleeding were observed. In CAPRIE, itching was the only adverse effect seen more frequently with clopidogrel than aspirin. In CURE, there was no difference in the rate of non-bleeding adverse events. Rashes and itching were uncommon in studies (between 0.1 and 1% of people); serious hypersensitivity reactions are rare. 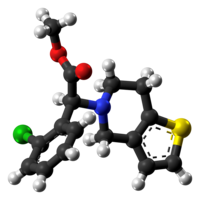 Clopidogrel generally has a low potential to interact with other pharmaceutical drugs. Combination with other drugs that affect blood clotting, such as aspirin, heparins and thrombolytics, showed no relevant interactions. Naproxen did increase the likelihood of occult gastrointestinal bleeding, as might be the case with other nonsteroidal anti-inflammatory drugs. As clopidogrel inhibits the liver enzyme CYP2C19 in cellular models, it has been theorized that it might increase blood plasma levels of drugs that are metabolized by this enzyme, such as phenytoin and tolbutamide. Clinical studies showed that this mechanism is irrelevant for practical purposes. In November 2009, the FDA announced that clopidogrel should be used with caution in people using the proton pump inhibitors omeprazole or esomeprazole, but pantoprazole appears to be safe. The newer antiplatelet agent prasugrel has minimal interaction with (es)omeprazole, hence might be a better antiplatelet agent (if no other contraindications are present) in people who are on these proton pump inhibitors. Clopidogrel is a prodrug, which is activated in two steps, first by CYP2C19, CYP1A2 and CYP2B6, then by CYP2C19, CYP2C9, CYP2B6 and CYP3A. The active metabolite then specifically and irreversibly inhibits the P2Y12 subtype of ADP receptor, which is important in activation of platelets and eventual cross-linking by the protein fibrin. Platelet inhibition can be demonstrated two hours after a single dose of oral clopidogrel, but the onset of action is slow, so a loading dose of either 600 or 300 mg is administered when a rapid effect is needed. Clopidogrel (top left) being activated: The first step is an oxidation mediated (mainly) by CYP2C19, unlike the activation of the related drug prasugrel. The two structures at the bottom are tautomers of each other; and the final step is a hydrolysis. The active metabolite (top right) has Z configuration at the double bond C3–C16 and possibly R configuration at the newly asymmetric C4. After repeated oral doses of 75 mg of clopidogrel (base), plasma concentrations of the parent compound, which has no platelet-inhibiting effect, are very low and, in general, are below the quantification limit (0.258 µg/l) beyond two hours after dosing. Clopidogrel is activated in the liver by cytochrome P450 enzymes, including CYP2C19. Due to opening of the thiophene ring, the chemical structure of the active metabolite has three sites that are stereochemically relevant, making a total of eight possible isomers. These are: a stereocentre at C4 (attached to the —SH thiol group), a double bond at C3—C16, and the original stereocentre at C7. Only one of the eight structures is an active antiplatelet drug. This has the following configuration: Z configuration at the C3—C16 double bond, the original S configuration at C7, and, although the stereocentre at C4 cannot be directly determined, as the thiol group is too reactive, work with the active metabolite of the related drug prasugrel suggests the R-configuration of the C4 group is critical for P2Y12 and platelet-inhibitory activity. The active metabolite has an elimination half-life of about 0.5 to 1.0 h, and acts by forming a disulfide bridge with the platelet ADP receptor. Patients with a variant allele of CYP2C19 are 1.5 to 3.5 times more likely to die or have complications than patients with the high-functioning allele. Following an oral dose of 14C-labeled clopidogrel in humans, about 50% was excreted in the urine and 46% in the feces in the five days after dosing. Absorption and distribution: Clopidogrel is rapidly absorbed after oral administration of repeated doses of 75-milligram clopidogrel (base), with peak plasma levels (about 3 mg/l) of the main circulating metabolite occurring around one hour after dosing. The pharmacokinetics of the main circulating metabolite are linear (plasma concentrations increased in proportion to dose) in the dose range of 50 to 150 mg of clopidogrel. Absorption is at least 50% based on urinary excretion of clopidogrel-related metabolites. Clopidogrel and the main circulating metabolite bind reversibly in vitro to human plasma proteins (98% and 94%, respectively). The binding is not saturable in vitro up to a concentration of 110 μg/ml. In March 2010, the U.S. FDA added a boxed warning to Plavix alerting that the drug can be less effective in people unable to metabolize the drug to convert it to its active form. CYP2C19 is an important drug-metabolizing enzyme that catalyzes the biotransformation of many clinically useful drugs, including antidepressants, barbiturates, proton pump inhibitors, and antimalarial and antitumor drugs. Clopidogrel is one of the drugs metabolized by this enzyme. Several recent landmark studies have proven the importance of 2C19 genotyping in treatment using clopidogrel. In March 2010, the FDA put a black box warning on Plavix to make patients and healthcare providers aware that CYP2C19-poor metabolizers, representing up to 14% of patients, are at high risk of treatment failure and that testing is available. Patients with variants in cytochrome P-450 2C19 (CYP2C19) have lower levels of the active metabolite of clopidogrel, less inhibition of platelets, and a 3.58-times greater risk for major adverse cardiovascular events such as death, heart attack, and stroke; the risk was greatest in CYP2C19 poor metabolizers. Plavix is marketed worldwide in nearly 110 countries, with sales of US$6.6 billion in 2009. It had been the second-top-selling drug in the world for a few years as of 2007 and was still growing by over 20% in 2007. U.S. sales were US$3.8 billion in 2008. Before the expiry of its patent, clopidogrel was the second best-selling drug in the world. In 2010, it grossed over US$9 billion in global sales. In 2006, generic clopidogrel was briefly marketed by Apotex, a Canadian generic pharmaceutical company before a court order halted further production until resolution of a patent infringement case brought by Bristol-Myers Squibb. The court ruled that Bristol-Myers Squibb's patent was valid and provided protection until November 2011. The FDA extended the patent protection of clopidogrel by six months, giving exclusivity that would expire on May 17, 2012. The FDA approved generic versions of Plavix on May 17, 2012. Generic clopidogrel is marketed by many companies worldwide under many brand names, including combination drugs with acetylsalicylic acid (aspirin). As of March 2017, brands included Aclop, Actaclo, Agregex, Agrelan, Agrelax, Agreless, Agrelex, Agreplat, Anclog, Angiclod, Anplat, Antiagrex, Antiban, Antigrel, Antiplaq, Antiplar, Aplate, Apolets, Areplex, Artepid, Asogrel, Atelit, Atelit, Ateplax, Atervix, Atheros, Athorel, Atrombin, Attera, Bidogrel, Bigrel, Borgavix, Carder, Cardogrel, Carpigrel, Ceraenade, Ceruvin, Cidorix, Clatex, Clavix, Clentel, Clentel, Clidorel, Clodel, Clodelib, Clodian, Clodil, Cloflow, Clofre, Clogan, Clogin, Clognil, Clogrel, Clogrelhexal, Clolyse, Clont, Clood, Clopacin, Clopcare, Clopeno, Clopex Agrel, Clopez, Clopi, Clopid, Clopida, Clopidep, Clopidexcel, Clopidix, Clopidogrel, Clopidogrelum, Clopidomed, Clopidorex, Clopidosyn, Clopidoteg, Clopidowel, Clopidra, Clopidrax, Clopidrol, Clopigal, Clopigamma, Clopigrel, Clopilet, Clopimed, Clopimef, Clopimet, Clopinovo, Clopione, Clopiright, Clopirite, Clopirod, Clopisan, Clopistad, Clopistad, Clopitab, Clopithan, Clopitro, ClopiVale, Clopivas, Clopivaz, Clopivid, Clopivin, Clopix, Cloplat, Clopra, Cloprez, Cloprez, Clopval, Clorel, Cloriocard, Cloroden, Clotix, Clotiz, Clotrombix, Clova, Clovas, Clovax, Clovelen, Clovex, Clovexil, Clovix, Clovvix, Copalex, Copegrel, Copidrel, Copil, Cordiax, Cordix, Corplet, Cotol, CPG, Cugrel, Curovix, Dapixol, Darxa, Dasogrel-S, Dclot, Defrozyp, Degregan, Deplat, Deplatt, Diclop, Diloxol, Dilutix, Diporel, Doglix, Dogrel, Dogrel, Dopivix, Dorel, Dorell, Duopidogrel, DuoPlavin, Eago, Egitromb, Espelio, Eurogrel, Expansia, Farcet, Flucogrel, Fluxx, Freeclo, Globel, Glopenel, Grelet, Greligen, Grelix, Grepid, Grepid, Grindokline, Heart-Free, Hemaflow, Hyvix, Idiavix, Insigrel, Iscover, Iskimil, Kafidogran, Kaldera, Kardogrel, Karum, Kerberan, Keriten, Klepisal, Klogrel, Klopide, Klopidex, Klopidogrel, Klopik, Klopis, Kogrel, Krossiler, Larvin, Lodigrel, Lodovax, Lofradyk, Lopigalel, Lopirel, Lyvelsa, Maboclop, Medigrel, Miflexin, Mistro, Mogrel, Monel, Monogrel, Moytor, Myogrel, Nabratin, Nadenel, Nefazan, Niaclop, Nivenol, Noclog, Nofardom, Nogreg, Nogrel, Noklot, Norplat, Novigrel, Oddoral, Odrel, Olfovel, Opirel, Optigrel, Panagrel, Pedovex, Pegorel, Piax, Piclokare, Pidgrel, Pidogrel, Pidogul, Pidovix, Pigrel, Pingel, Placta, Pladel, Pladex, Pladogrel, Plagerine, Plagrel, Plagril, Plagrin, Plahasan, Plamed, Planor, PlaquEx, Plasiver, Plataca, Platarex, Platec, Platel, Platelex, Platexan, Platil, Platless, Platogrix, Platrel, Plavedamol, Plavicard, Plavictonal, Plavidosa, Plavigrel, Plavihex, Plavitor, Plavix, Plavocorin, Plavogrel, Plavos, Pleyar, Plogrel, Plvix, Pravidel, Pregrel, Provic, Psygrel, Q.O.L, Ravalgen, Replet, Respekt, Revlis, Ridlor, Roclas, Rozak, Sanvix, Sarix, Sarovex, Satoxi, Shinclop, Sigmagrel, Simclovix, Sintiplex, Stazex, Stroka, Stromix, Sudroc, Synetra, Talcom, Tansix, Tessyron, Thinrin, Throimper, Thrombifree, Thrombo, Timiflo, Tingreks, Torpido, Triosal, Trogran, Troken, Trombex, Trombix, Tuxedon, Unigrel, Unplaque, Vaclo, Vasocor, Vatoud, Venicil, Vidogrel, Vivelon, Vixam, Xydrel, Zakogrel, Zillt, Zopya, Zylagren, Zyllt, and Zystol. As of 2017 it was marketed as a combination drug with acetylsalicylic acid (aspirin) under the brand names Anclog Plus, Antiban-ASP, Asclop, Asogrel-A, Aspin-Plus, Cargrel-A, Clas, Clasprin, Clavixin Duo, Clodrel Forte, Clodrel Plus, Clofre AS, Clognil Plus, Clontas, Clopid-AS, Clopid-AS, Clopida A, Clopil-A, Clopirad-A, Clopirin, Clopitab-A, Clorel-A, Clouds, Coplavix, Coplavix, Combiplat, Cugrel-A, Dorel Plus, DuoCover, DuoCover, DuoPlavin, DuoPlavin, Ecosprin Plus, Grelet-A, Lopirel Plus, Myogrel-AP, Noclog Plus, Noklot Plus, Norplat-S, Odrel Plus, Pidogul A, Pladex-A, Plagerine-A, Plagrin Plus, Replet Plus Plavix Plus, Stromix-A, and Thrombosprin. Clopidogrel has also been shown to be effective at decreasing platelet aggregation in cats, so its use in prevention of feline aortic thromboembolism has been advocated. ^ a b c d e "Clopidogrel International brand names". Drugs.com. Archived from the original on 1 April 2017. Retrieved 1 April 2017. ^ a b c d e f g h i j "Clopidogrel Bisulfate". The American Society of Health-System Pharmacists. Archived from the original on 21 December 2016. Retrieved 8 December 2016. ^ "Clopidogrel (Plavix) Use During Pregnancy". www.drugs.com. Archived from the original on 21 December 2016. Retrieved 14 December 2016. ^ Fischer, Janos; Ganellin, C. Robin (2006). Analogue-based Drug Discovery. John Wiley & Sons. p. 453. ISBN 9783527607495. Archived from the original on 2016-12-20. ^ "Clopidogrel Bisulfate". International Drug Price Indicator Guide. Retrieved 8 December 2016. ^ Hamilton, Richart (2015). Tarascon Pocket Pharmacopoeia 2015 Deluxe Lab-Coat Edition. Jones & Bartlett Learning. p. 147. ISBN 9781284057560. ^ O'Gara PT, Kushner FG, Ascheim DD, Casey DE, Chung MK, de Lemos JA, et al. (January 2013). "2013 ACCF/AHA guideline for the management of ST-elevation myocardial infarction: a report of the American College of Cardiology Foundation/American Heart Association Task Force on Practice Guidelines". J. Am. Coll. Cardiol. 61 (4): e78–140. doi:10.1016/j.jacc.2012.11.019. PMID 23256914. ^ Jneid H, Anderson JL, Wright RS, Adams CD, Bridges CR, Casey DE, Ettinger SM, Fesmire FM, Ganiats TG, Lincoff AM, Peterson ED, Philippides GJ, Theroux P, Wenger NK, Zidar JP, Anderson JL (August 2012). "2012 ACCF/AHA focused update of the guideline for the management of patients with unstable angina/Non-ST-elevation myocardial infarction (updating the 2007 guideline and replacing the 2011 focused update): a report of the American College of Cardiology Foundation/American Heart Association Task Force on practice guidelines". Circulation. 126 (7): 875–910. doi:10.1161/CIR.0b013e318256f1e0. PMID 22800849. ^ Fihn SD, Gardin JM, Abrams J, Berra K, Blankenship JC, Dallas AP, Douglas PS, Foody JM, Gerber TC, Hinderliter AL, King SB, Kligfield PD, Krumholz HM, Kwong RY, Lim MJ, Linderbaum JA, Mack MJ, Munger MA, Prager RL, Sabik JF, Shaw LJ, Sikkema JD, Smith CR, Smith SC, Spertus JA, Williams SV (December 2012). "2012 ACCF/AHA/ACP/AATS/PCNA/SCAI/STS guideline for the diagnosis and management of patients with stable ischemic heart disease: executive summary: a report of the American College of Cardiology Foundation/American Heart Association task force on practice guidelines, and the American College of Physicians, American Association for Thoracic Surgery, Preventive Cardiovascular Nurses Association, Society for Cardiovascular Angiography and Interventions, and Society of Thoracic Surgeons". Circulation. 126 (25): 3097–137. doi:10.1161/CIR.0b013e3182776f83. PMID 23166210. ^ Gagne JJ, Bykov K, Choudhry NK, Toomey TJ, Connolly JG, Avorn J (Sep 17, 2013). "Effect of smoking on comparative efficacy of antiplatelet agents: systematic review, meta-analysis, and indirect comparison". BMJ (Clinical Research Ed.). 347: f5307. doi:10.1136/bmj.f5307. PMC 3775704. PMID 24046285. ^ Chan FK, Ching JY, Hung LC, Wong VW, Leung VK, Kung NN, Hui AJ, Wu JC, Leung WK, Lee VW, Lee KK, Lee YT, Lau JY, To KF, Chan HL, Chung SC, Sung JJ (2005). "Clopidogrel versus aspirin and esomeprazole to prevent recurrent ulcer bleeding". N. Engl. J. Med. 352 (3): 238–44. doi:10.1056/NEJMoa042087. PMID 15659723. ^ Mistry SD, Trivedi HR, Parmar DM, Dalvi PS, Jiyo C (2011). "Impact of proton pump inhibitors on efficacy of clopidogrel: Review of evidence". Indian Journal of Pharmacology. 43 (2): 183–6. doi:10.4103/0253-7613.77360. PMC 3081459. PMID 21572655. ^ Ho PM, Maddox TM, Wang L, Fihn SD, Jesse RL, Peterson ED, Rumsfeld JS (2009). "Risk of adverse outcomes associated with concomitant use of clopidogrel and proton pump inhibitors following acute coronary syndrome". Journal of the American Medical Association. 301 (9): 937–44. doi:10.1001/jama.2009.261. PMID 19258584. ^ Stockl KM, Le L, Zakharyan A, Harada AS, Solow BK, Addiego JE, Ramsey S (April 2010). "Risk of rehospitalization for patients using clopidogrel with a proton pump inhibitor" (PDF). Arch Intern Med. 170 (8): 704–10. doi:10.1001/archinternmed.2010.34. ISSN 1538-3679. PMID 20421557. Archived from the original on 2016-03-04. ^ Wathion, Noël. "Public statement on possible interaction between clopidogrel and proton pump inhibitors" (PDF). Archived (PDF) from the original on 6 February 2011. Retrieved 31 March 2011. ^ Hughes, Sue. "EMEA issues warning on possible clopidogrel-PPI interaction, but is there really a problem?". Retrieved 31 March 2011. ^ Zakarija A, Bandarenko N, Pandey DK, Auerbach A, Raisch DW, Kim B, Kwaan HC, McKoy JM, Schmitt BP, Davidson CJ, Yarnold PR, Gorelick PB, Bennett CL (2004). "Clopidogrel-Associated TTP An Update of Pharmacovigilance Efforts Conducted by Independent Researchers, Pharmaceutical Suppliers, and the Food and Drug Administration" (PDF). Stroke. 35 (2): 533–8. doi:10.1161/01.STR.0000109253.66918.5E. PMID 14707231. Archived (PDF) from the original on 2016-01-07. ^ a b c d "Plavix Highlights of prescribing information" (PDF). Archived (PDF) from the original on 2015-07-01. ^ Diener HC, Bogousslavsky J, Brass LM, Cimminiello C, Csiba L, Kaste M, Leys D, Matias-Guiu J, Rupprecht HJ (2004). "Aspirin and clopidogrel compared with clopidogrel alone after recent ischaemic stroke or transient ischaemic attack in high-risk patients (MATCH): randomised, double-blind, placebo-controlled trial". The Lancet. 364 (9431): 331–7. doi:10.1016/S0140-6736(04)16721-4. PMID 15276392. ^ a b Jasek, W, ed. (2007). Austria-Codex (in German) (62nd ed.). Vienna: Österreichischer Apothekerverlag. pp. 6526–7. ISBN 978-3-85200-181-4. ^ DeNoon, Daniel J. "FDA Warns Plavix Patients of Drug Interactions" Archived 2016-02-23 at the Wayback Machine, WebMD, 2009-11-19. Retrieved 2009-11-23. ^ "Public Health Advisory: Updated Safety Information about a drug interaction between Clopidogrel Bisulfate (marketed as Plavix) and Omeprazole (marketed as Prilosec and Prilosec OTC)". Food and Drug Administration (FDA). November 17, 2009. Archived from the original on 2009-12-29. Retrieved March 13, 2010. ^ Wedemeyer RS, Blume H (2014). "Pharmacokinetic Drug Interaction Profiles of Proton Pump Inhibitors: An Update". Drug Safety. 37 (4): 201–11. doi:10.1007/s40264-014-0144-0. PMC 3975086. PMID 24550106. ^ John J, Koshy SK (2012). "Current Oral Antiplatelets: Focus Update on Prasugrel". Journal of American Board of Family Medicine. 25 (3): 343–349. doi:10.3122/jabfm.2012.03.100270. PMID 22570398. ^ a b Cattaneo, M (March 2012). "Response variability to clopidogrel: is tailored treatment, based on laboratory testing, the right solution?". Journal of Thrombosis and Haemostasis. 10 (3): 327–36. doi:10.1111/j.1538-7836.2011.04602.x. PMID 22221409. ^ a b Pereillo JM, Maftouh M, Andrieu A, Uzabiaga MF, Fedeli O, Savi P, Pascal M, Herbert JM, Maffrand JP, Picard C (2002). "Structure and stereochemistry of the active metabolite of clopidogrel". Drug Metab. Dispos. 30 (11): 1288–95. doi:10.1124/dmd.30.11.1288. PMID 12386137. ^ Mega JL, Close SL, Wiviott SD, Shen L, Hockett RD, Brandt JT, Walker JR, Antman EM, Macias W, Braunwald E, Sabatine MS (January 2009). "Cytochrome p-450 polymorphisms and response to clopidogrel". The New England Journal of Medicine. 360 (4): 354–62. doi:10.1056/NEJMoa0809171. PMID 19106084. ^ Simon T, Verstuyft C, Mary-Krause M, Quteineh L, Drouet E, Méneveau N, Steg PG, Ferrières J, Danchin N, Becquemont L, French Registry of Acute ST-Elevation Non-ST-Elevation Myocardial Infarction (FAST-MI) Investigators (January 2009). "Genetic Determinants of Response to Clopidogrel and Cardiovascular Events". The New England Journal of Medicine. 360 (4): 363–75. doi:10.1056/NEJMoa0808227. PMID 19106083. ^ Collet JP, Hulot JS, Pena A, Villard E, Esteve JB, Silvain J, Payot L, Brugier D, Cayla G, Beygui F, Bensimon G, Funck-Brentano C, Montalescot G (January 2009). "Cytochrome P450 2C19 polymorphism in young patients treated with clopidogrel after myocardial infarction: a cohort study". The Lancet. 373 (9660): 309–17. doi:10.1016/S0140-6736(08)61845-0. PMID 19108880. ^ a b "FDA Announces New Boxed Warning on Plavix: Alerts patients, health care professionals to potential for reduced effectiveness" (Press release). Food and Drug Administration (FDA). March 12, 2010. Archived from the original on March 15, 2010. Retrieved March 13, 2010. ^ "FDA Drug Safety Communication: Reduced effectiveness of Plavix (clopidogrel) in patients who are poor metabolizers of the drug". Food and Drug Administration (FDA). March 12, 2010. Archived from the original on March 15, 2010. Retrieved March 13, 2010. ^ "New products and markets fuel growth in 2005". IMS Health. Archived from the original on June 3, 2008. Retrieved 2009-03-02. ^ "Top Ten Global Products – 2007" (PDF). IMS Health. 2008-02-26. Archived (PDF) from the original on 2011-02-25. Retrieved 2009-03-02. ^ Topol EJ, Schork NJ (January 2011). "Catapulting clopidogrel pharmacogenomics forward". Nature Medicine. 17 (1): 40–41. doi:10.1038/nm0111-40. PMID 21217678. ^ "Preliminary Injunction Against Apotex Upheld on Appeal" (Press release). Bristol-Myers Squibb. December 8, 2006. Archived from the original on April 14, 2014. Retrieved 2010-03-14. ^ "U.S. judge upholds Bristol, Sanofi patent on Plavix". Reuters. June 19, 2007. Archived from the original on May 20, 2011. Retrieved 2007-09-05. ^ "FDA Gives Plavix a 6 Month Extension-Patent Now Expires on May 17, 2012". January 26, 2011. Archived from the original on October 12, 2011. Retrieved 2012-01-12. ^ "FDA approves generic versions of blood thinner Plavix" (Press release). Food and Drug Administration (FDA). May 17, 2012. Archived from the original on March 11, 2016. ^ Hogan DF, Andrews DA, Green HW, et al. (2004). "Antiplatelet effects and pharmacodynamics of clopidogrel in cats". J Am Vet Med Assoc. 225 (9): 1406–1411. doi:10.2460/javma.2004.225.1406.